The attractions of the Isle of Iona are partly related to its place in the Inner Hebrides and location close to the Isle of Mull. Other attractions are related to it being a historic and important religious centre. The island of Iona is only 3 miles from north to south and 1½ miles from east to west and is steeped in history being the cradle of Scottish Christianity. 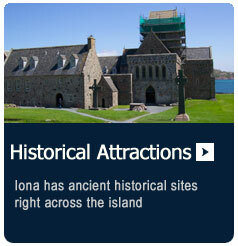 For centuries people have been visiting Iona - from the Isle of Mull, it is an easy island-hop journey to Iona. Today's visitors take the Caledonian MacBrayne ferry which leaves from Fionnphort on the Isle of Mull. The island is home to a thriving local community consisting of residential properties, shops, crofts, farms, hotels, bed and breakfasts, holiday cottages and restaurants. Iona has some stunning white shell-sand beaches, a golf course (free), an old marble quarry, interesting walks and wildlife and genuine Hebridean hospitality. Iona Abbey, once a simple structure made from turf, daub and wattle has undergone a major modern restoration.The tradition of worship at the Abbey continues through daily services and teaching. Visitors are welcome to join services. The small graveyard next to the abbey is a wonder - it is thought to be the final resting place of 48 medieval kings of Norway, Ireland, and Scotland, including the eleventh-century king Macbeth of Shakespearean fame. 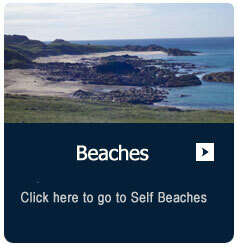 Away from the main village of Baile Mòr, there are great beaches and clear turquoise waters round most of the coast, particularly in the north. 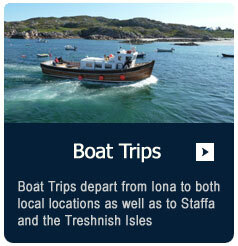 Combined trips to Iona and Staffa can be taken from Fionnphort and also from Ulva Ferry.